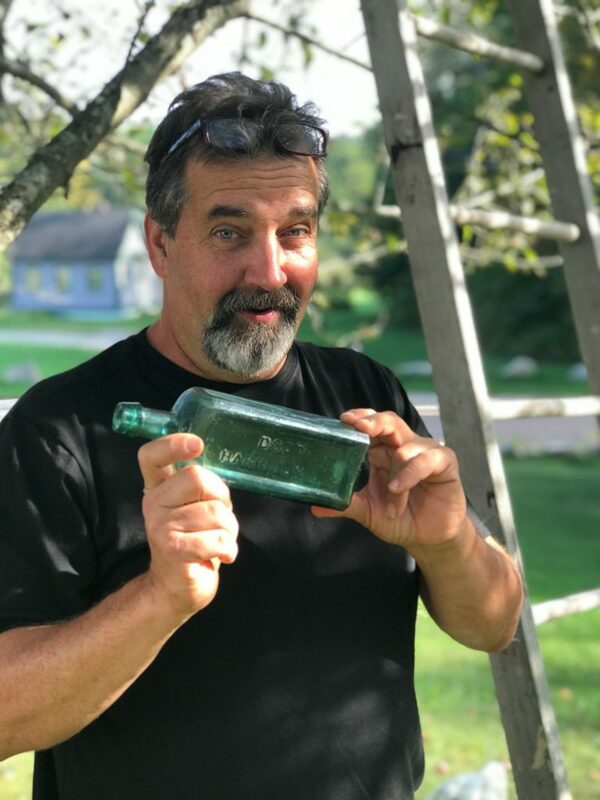 Bram Hepburn has been contributing to WorthPoint for several years, and has been collecting and digging antique American bottles even longer. Though his education and business ventures have been in the culinary arts field, his passion for antiques has now moved to the forefront, especially antique American bottles. He has written numerous articles on various collectible antiques for Worthpoint, and operates Hepburn & Co. Antiques and Auctions in Eliot, Maine. But if he had his druthers, he’d be out hunting the woods and waters of New England for his lifelong love of treasures of early American bottles and relics. What began as a backyard hobby as a boy in the 1970s, grew in to an interest that has enabled him to travel throughout the U.S. to bottle shows and festivals, as well as through the gorgeous backwoods trails of New England hunting for early dumping sites. As a sort of “second act” to his hobbying life, Bram became a certified scuba diver, which opened up an amazing new source for 19th Century “trash,” that thankfully, no one had yet found. Though well versed in multiple categories of antiques and collectibles, early American blown glass, mold blown proprietor bottles, and telegraph insulators are his fields of expertise. As a collector, his favorites are New England blown utilitarian bottles from the Keene and Stoddard glass houses in New Hampshire. How did you get your start in the antique bottles hobby? In the 1970s, the farm we lived on had an old trash dump about a quarter of a mile back in the woods. We drove the tractor out to it and for a week or so, dug every bottle we could find. Some were common screw top bottles, while others were a bit older. Regardless, I was hooked, and the more I learned about the subject, the more I was determined to find more sites, and hopefully much older sites! How did you get involved even deeper than just a hobby into the antiques and collectibles industries? The big game changer for me, was buying a huge collection of bottles from a retiring collector. This was at a time when my new bride was hoping to put a down payment on our first home, and spending a big chunk of money on a bunch of old bottles “raised some eyebrows.” But a week later, I filled my old van to the roof with boxes of bottles, and drove them to a huge 3-day outdoor bottle show in York Pennsylvania. I came back with twice the money the collection cost, plus still had a half van load of bottles left to sell. The wheeling and dealing began in earnest! How did you come to know WorthPoint? How could I not come to know WorthPoint? Any time I would go online to find the value of a bottle I had dug, I’d type it in to Google, and up would come WorthPoint, with a current list of values! What is the one piece of advice you would give your younger self, just starting out in the a/c world? I’m not sure I’m wise enough yet, to be giving a younger me advice! I suppose I would just reaffirm what my gut told me then, which was a sort of a “keep your day job” philosophy. Meaning that, if I had used my bottle dealing as a business which I solely relied on to pay the mortgage, I think I would have lost my true love of the hobby for hobby’s’ sake. Stress kills, including the love of a hobby. And it’s is a beautiful hobby, there is nothing like it in the world, literally. Digging something from the ground, and having it look as beautiful as this, while knowing the last person who touched it before they tossed it there may have had Abraham Lincoln as their president – well that is truly unique, and I’m so glad that I still love to do it!